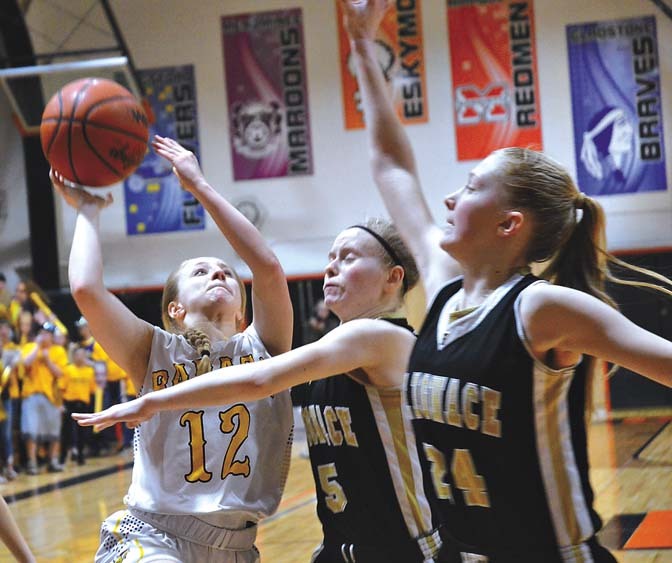 Justin St. Ours/Daily Press (Escanaba) Baraga’s Erin Kamarainen (12) puts up a shot against St. Ignace’s Tessa Shepard (5) and Madison Olsen (24) Tuesday at Escanaba. The victory sends St. Ignace (26-0) to Thursday’s semifinals at Calvin College where they will meet Kingston (24-2) at 5:30 p.m. 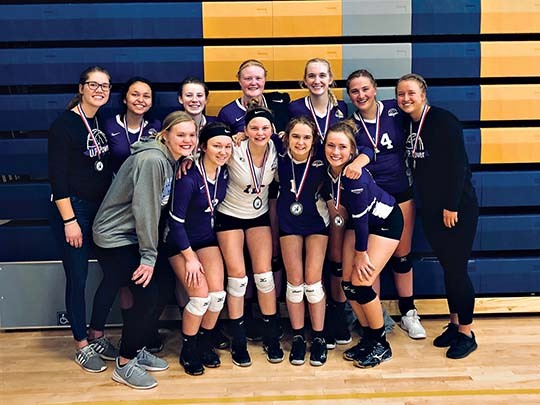 Second-ranked Baraga finished 21-4. Baraga was within 8-6 following a pair of free throws by freshman Reide Osterman three minutes into the contest. Sophomore guard Emmalee Hart scored 16 points for the Saints. Emma Felleppa, a 6-foot-2 junior, collected 12 points and 11 boards to go with three blocked shots in a reserve role. Freshman guard Ally Schultz, who played junior high ball at Bark River-Harris, added seven boards and five assists and junior Tessa Shepard had four assists. SI: Mortensen 3, E. Hart 16, Coveyou 29, Marshall 8, Frazier 2, Olsen 3, Schultz 3, Felleppa 12; FT: 17-24; Fouls: 16; Fouled out: none; 3-point field goals: E. Hart 2, Marshall 1. BAR: Jahfetson 13, Kamarainen 3, Koskinen 7, Osterman 7, Lindemann 8, Durant 7; FT: 8-19; Fouls: 20; Fouled out: none; 3-point field goals: Jahfetson 1, Lindemann 1, Durant 1.